New research led by scientists at the Tokyo Institute of Technology provided data from real-time live-imaging of fluorescent signals derived from osteoblasts and osteoclasts of medaka fish after only one day of exposure to microgravity aboard the International Space Station (ISS). Findings from the study—entitled “Acute transcriptional up-regulation specific to osteoblasts/osteoclasts in medaka fish immediately after exposure to microgravity”—were published recently in Scientific Reports. The investigators are hopeful that their results will be useful not only for combating the effects of long-term space travel, but also elucidating the mechanisms of various bone-density disorders. In their experiments, the Japanese researchers used four different double medaka transgenic lines focusing on up-regulation of fluorescent signals of osteoblasts and osteoclasts to clarify the effect of gravity on the interaction of the two bone cells. They also studied changes in the gene expression in the transgenic fish by transcriptome analysis. Interestingly, the researchers found increases in both osteoblast- and osteoclast-specific promoter-driven GFP and DsRed signals one day after launch and continued for up to eight days. The live-imaging of fluorescence microscopy signals from the fish aboard the ISS were monitored remotely from Tsukuba Space Center in Japan. The microscopic images of osteoblasts showed the intensity of osterix– and osteocalcin-DsRed in pharyngeal bones had increased, one day after launch. This increased effect continued for eight days for osterix and five days for osteocalcin. 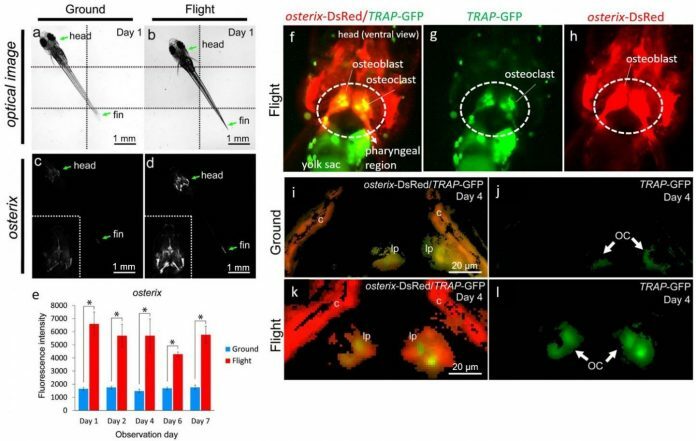 Concomitantly, for osteoclasts, the fluorescent signals observed from TRAP-GFP and MMP9-DsRed increased significantly on the fourth and sixth days after launch. While the precise molecular mechanisms responsible for the loss of bone density are not yet fully understood, the current study is a significant step toward uncovering the mechanisms governing changes in bone structure immediately after the onset of microgravity, when bone loss is triggered. The findings imply that changes in osteoblasts and osteoclasts occur very soon after launch and may need to be quickly addressed for long-term space flight.